Forest Sentinels By Todd Price. Please pass this onto your groups, friends and potential recruits! Our apologies if you get this more than once, it is impossible to know who belongs to what web group! Interstaters and ALL periods welcome! This will be a great weekend and the aim of it is for everyone to try everything. I know that you may be an ACW reenactor, Napoleonic reenactor or a Colonial reenactor but above all you are a REENACTOR. We all enjoy our great hobby because of the same reasons and have FUN, it does not matter what uniform you wear. We don’t expect you to join another period or even have the kit but just to have a go! This is a closed event, so no public and above all no authenticity police, kit is best effort! It’s about having a go; lots of loan kit will be available. Imagine how great it will be to get 50-60 people on the field at the same time! So bring along all your spare kit and let’s see what we can really do when we all work together. So please: DO everything, bring an open mind, bring a sense of humor and bring all your spare kit! There will be a small trader’s row so bring cash too!! We will also set up a Bring and Buy table if you want to bring kit to sell; just put a label on it with your name and price on and put the item on the Bring-and-Buy table. MEALS: Meals provided: Saturday: Lunch and Dinner. Sunday: Breakfast and Lunch. Tea and Coffee all day both days. Please bring your own crockery, cutlery and cups/tankards. POWDER: There will be no time to roll cartridges so please bring LOTS! We will have TWO battles per day and lots of drill and fire manoeuvres so expect to fire 60-80 per day!! This is up to you to do; if you don’t bring it you can’t fire it! A Safety Brief will be given on Saturday and Sunday mornings. EVENING EVENTS: OK prepare to have a party! Drinks will be available (for a donation) and several social activities will be available, Cards, Dice and Dancing! I will be teaching a “Period” Drinking Dice game for those brave enough!! Again HAVE A GO! If you play an instrument; bring it along! FIRES: No fire pits! A barrel and firewood will be provided and lit for those who wish to stand outside, but the indoor area is heated. HORSES: Horses from other groups are welcome by prior arrangement. Please contact Adrien on the details below. The site is a Pollocrosse Ground so plenty of Horse facilities and yards are available! Don’t forget to bring a modern Helmet for the initial drill session. PROGRAM: This is VERY tight; so please be where you are supposed to be when you are supposed to be there. If we have to wait for you, everyone misses out! I can’t stress enough please DO EVERYTHING! 08.00am Arrive & set up camp etc. 10.00am Unit NCO’s brief meeting - Napoleonic Kit. 10.15am Parade, brief welcome & unit safety procedure checks. 10.30am Individual units drill, also combining with cavalry. 1.10pm Groups Split - Skirmish Drill - Artillery - 30 min ea. 5.50pm Debrief (ALL). Flag lowering party. 8.00 - 9.00am Breakfast (provided) in Napoleonic gear, NCO brief. 1.15pm Lunch (provided) - Debrief and feedback. 2.00pm Pack up, clean weapons & depart. The event will be fully catered at a wonderful location (maps sent out closer to the event) that boasts plenty of room for each group to do its own thing, a large indoor heated area with kitchen and bar, camping, flushing toilets and HOT SHOWERS! There is plenty of room for camping and room for those who wish to throw a swag down in the indoor area (after the evening party!). Camping will be available from Friday (midday) until Sunday night. A contribution of $30 will be requested from each person attending (including fence sitters) to cover venue hire and food (under 10s will be free). Each attendee is required to have Insurance and this will need to be shown, i.e. ALHF card or other proof. Sponsored by "The Cavalry Workshop"
Wilderness Living Part 2 Of Number 7. Video. Wilderness Living Part 1 Of 7. Video. My sincere thanks to Chris Grant for bringing these videos to my attention. Australian Period Clothing. A Link. Not everyone used a tinder box, and no doubt some of those who did have a tinder box may not have used it for making fire per se. Some people used the bird nest method of placing tinder in a bundle of small kindling & striking sparks on the tinder in the nest. Others may have used the tinder box to prepare tinder, but used the nest method to actually make fire, instead of striking sparks into the tinder box. 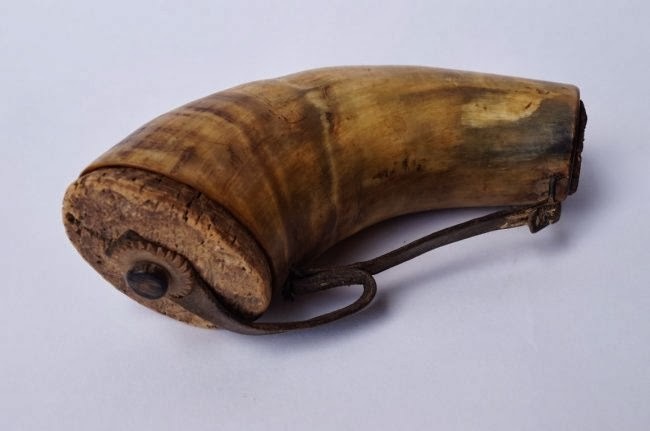 Others used a tinder horn, this could be used like the tinderbox and was a good alternative if you did not have a tinder box/tinderbox. Then again, not everyone was successful in making fire. Understanding how some people thought back in the 18th and 19th centuries is very difficult. Some having experienced hardship still failed to improve their lot so they would have better luck next time. Others however took notice and improved on their equipment. Others still did not survive because of their short comings. "There was Dry leaves and sticks under our shelter. I stoped the tuch hole of my gun with tallow and then did ketch fire and we made up a fire and Dryed our selves." 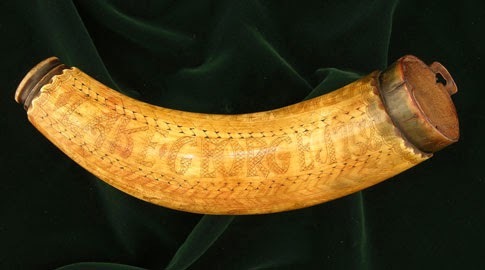 "There happened to be an iron pot and an ax on board--- they cut off a piece of the boat rope, and picked it to oakum, and putting it in the pan of a gun, with some powder, catched it on fire, which with some thin pieces cut from the mast, they kindled in the pot, and then cut up their mast, seats, &c. for fuel, and making a tent of their sail, wrapt themselves as well as they could;"
“In the woods we were under some disadvantage, having no fire-works”. Journal of John Woolman, 1720-1742. 18th Century Tinder Box Types. 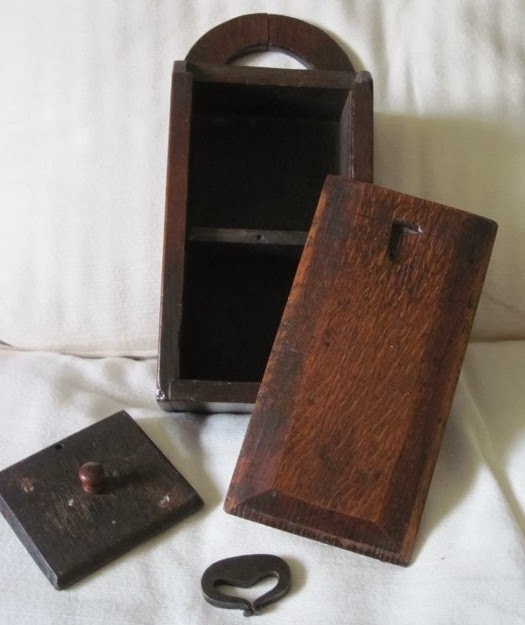 A wood tinder box showing the damper on the left for smothering the smouldering tinder, and a lid. My brass tinder box which is a copy of an original. Those tinder boxes which are smaller and shallow I assume were for carrying on the person, either in a pocket or pouch. Though we can't say for sure that larger tinder boxes were not carried beyond the home. My brass tinder box opened, showing the tinder inside. 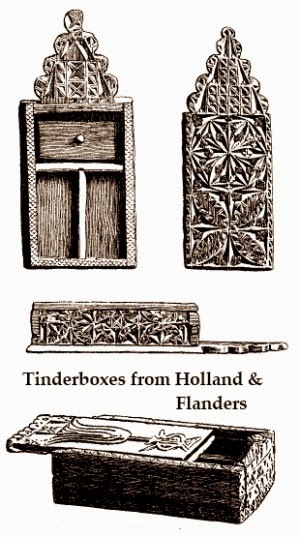 A Dutch tinder box made from wood with a carved design and a sliding lid. This is a Russian tinder box which appears to have a ceramic inlay to the hinged lid. Four small tinder boxes with hinged lids. This tinder box is dated 1734. A wood tinder box with a sliding draw dated 1761. Wood tinder boxes were typically used in the home. 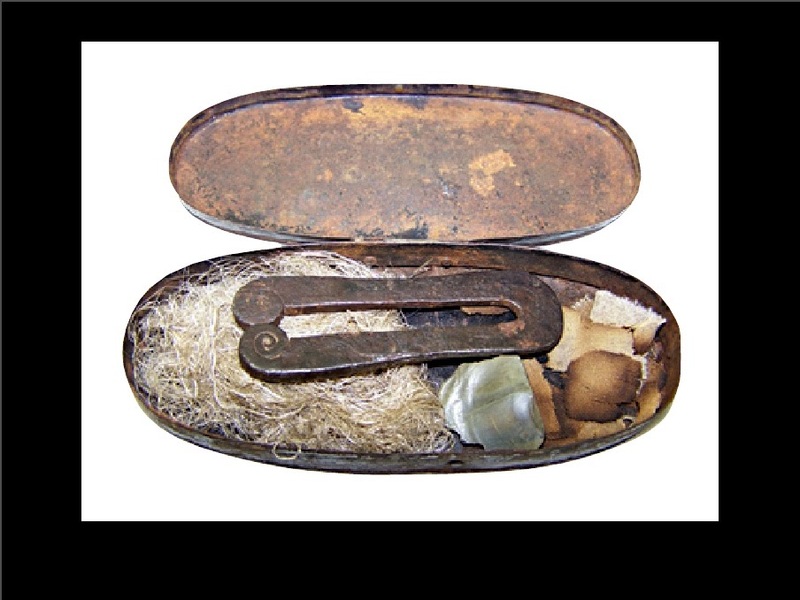 A brass Russian tinder box found in a shipwreck. Dated 1714. This tinder box reminds me of a period spectacle case, and it may have been so. What is important is that it has been used as a tinder box. My copy of a candle holder tinder box. Again a clumsy shape to carry in a pouch or pocket and typically a style used in the home. The same tinder box with a beeswax candle. 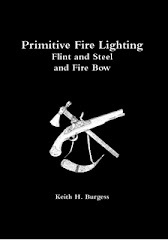 More on Flint and Steel and Tinderbox Fire Lighting. Or, every YOUNG WOMAN’S companion. To make a Substitute for Tinder made with Linen. Dissolve three ounces of salt petre in a pint and an half of fair Water in a Kettle or Pan over clear Fire: Then thoroughly wet twenty-four Sheets of smooth brown Paper separately in the hot Liquor, and lay them on some clean Place to dry. When you have Occasion, you may put a Piece in your Tinder-box, and using the Steel and Flint, it will catch like Wildfire. (please note that paper then was made from linen flax. Keith.). But when you will make tinder for a Gunners tinder boxe, take peeces of fustian, or of old and fine linnen clothe, make them to burn and flame in a fire, & suddenly before the flame which is in the doth die, choke the fire, & keepe their tinder so made in a boxe lined within with clothe, to the ende that it may not be moyste at any time. Appendix 20-1, Lucar, C., Translation of Tartaglia, Three Bookes of Colloquies Concerning the Arte of Shooting in Great and Samll Peeces of Artillerie with Appendix, London,1588. Finding information directly relating to Europe is a long haul, but I think we can take it for granted that whatever was used in England was also used in France, & if France was using cloth tinder, then most of if not all Europe was also using it. Mostly cloth tinder was used in the homes, tow rag was a common source, but linen also. Other places of use were aboard ship, as in the quote above. Travellers from one place to another eg from one town to another or from town house to country house would also normally carry charred cloth tinder. Cloth was charred like other plant tinders, directly in the fire, then it was smothered in the tinderbox. Normally the tinder remained in the tinderbox, fire was made directly from the tinderbox. Fire lighting using gunpowder was also used, with tinder material & with kindling material. 'Our party having separated, the important articles of tinder and matches were in the baggage of the division which had proceeded: and as the night was rainy and excessively dark, we were, for some time, under anxiety, lest we should have been deprived of the comfort and security of a fire. Fortunately, my powder-flask was in my saddlebags, and we succeeded in supplying the place of tinder, by moistening a piece of paper, and rubbing it with gunpowder. We placed our touch paper on an old cambric handkerchief, as the most readily combustible article in our stores. 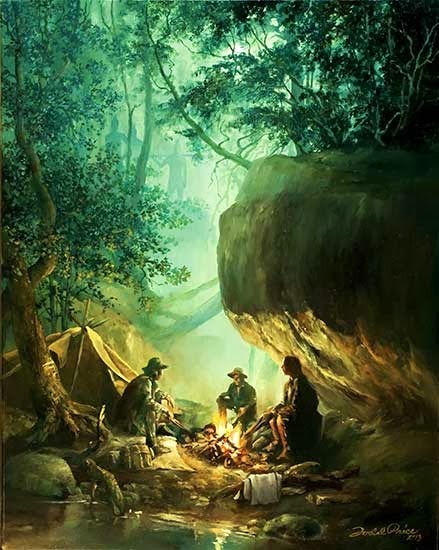 On this we scattered gunpowder pretty copiously, and our flint and steel soon enabled us to raise a flame, and collecting dry wood, we made a noble fire. Birkbeck, Morris. Notes on a Journey in America . London: Severn and Co., 1818. 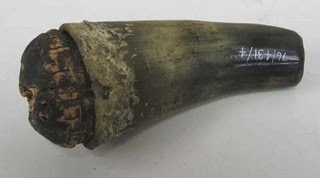 "Weapons of Warre: The Armaments of the Mary Rose"
though the base. These are darkened as though slightly scorched. Authentication. Use Of The Tinderbox. Recently I was asked what proof did I have that the tinderbox was used for making fire. First let me say that the tinderbox was not always used by everyone to make fire, there are period ways to make fire without using the tinderbox. 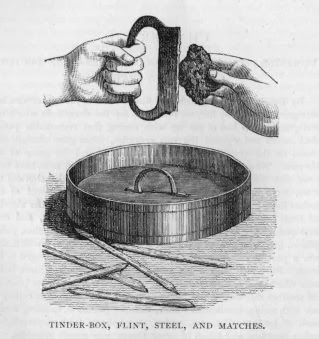 But, using the tinderbox is the easiest way to prepare tinder, and I have found that it is the easiest way to make fire when you know how to use the tinderbox properly, and have had plenty of experience. Here then is the primary information that I have so far, in the written word, and in images. The maid is stirring betimes, and slipping on her shoes and her petticoat, gropes for the tinder box, where after a conflict between the steel and the stone she begets a spark, at last the candle lights.... Matthew Stevenson, The Twelve Months, c1661. put them in Sheet by Sheet into the hot water till they are wet through, and then lay them on a clean Floor or Grass to dry. You may at any Time tear a Piece off, and put it in your Tinderbox,; it will catch like Wild-Fire. By this Means you may save all your Linen Rags in the Family, keep them clean in a Bag, and, if you are careful of them, they may produce you a Pair of Shoes and Stockings at the Years End; and by this Frugality you will have the Pleasure to think of encouraging the making of Paper, and employing the Industrious. Take those great things which are called olde Todestooles growing out of the bottomes of nuttrees, beechtrees, okes, and such like trees, drye them with the smoke of fire, & then cut them into as many peeces as you will, and hauing well beaten them, boyle the in strong lie with waule floure, or saltpeeter, till all the lie shal be consumend. After this laying them in a heape uppon a boorde, drie them in an oven which must not be made verie hotte, and after you haue so done, beate them well with a wooden mallet, and when you shall haue cause to use any parte of those Todestooles (now by the means above declared made touchwood) rubbe well that parte betweene your handes for to make it softe and apte to take fire. But when you will make tinder for a Gunners tinder boxe, take peeces of fustian, or of old and fine linnen clothe, make them to burn and flame in a fire, & suddenly before the flame which is in the doth die, choke the fire, & keepe their tinder so made in a boxe lined within with clothe, to the ende that it may not be moyste at any time. Pouchot, Pierre. Memoirs on the Late War in North America between France and England. Page 482. "You must provide yourself with a tinder box or with a burning mirror, or with both, to furnish them fire in the daytime to light their pipes, and in the evening when they have to encamp; these little services win their hearts. "Instructions for the Fathers of our Society who shall be sent to the Hurons." l637. 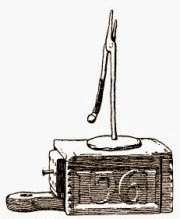 It (the tinderbox) was with this instrument, long before the invention of matches, that our grandfathers obtained light. I want to show you how the trick was managed. First of all it was necessary to have good tinder. To obtain this, they took a piece of linen and simply charred or burnt it, as you see I am doing now (Fig. 4). (Cambric, I am told, makes the best tinder for match-lighting, and the ladies, in the kindness of their hearts, formerly made a point of saving their old cambric handkerchiefs for this purpose.) The servants prepared the tinder over-night, for reasons I shall explain to you directly. Having made the tinder, they shut it down in the box with the lid (Fig. 3 A) to prevent contact with air. You see I have the tinder now safely secured in my tinder-box. Here is a piece of common flint, and here is the steel. Here too are the matches, and I am fortunate in having some of the old matches made many years ago, prepared as you see with a little sulphur upon their tips. Well, having got all these etceteras, box, tinder, flint and steel, we set to work in this way:—Taking the steel in one hand, and the flint in the other, I must give the steel a blow, or rather a succession of blows with the flint (Fig. 3 B). Notice what beautiful sparks I obtain! I want one of these sparks, if I can persuade it to do so, to fall on my tinder. There! it has done so, and my tinder has caught fire. I blow my fired tinder a little to make it burn better, and now I apply a sulphur match to the red-hot tinder. See, I have succeeded in getting my match in flame. I will now set light to one of these old-fashioned candles—a rushlight—with which our ancestors were satisfied before the days of gas and electric lighting. This was their light, and this was the way they lighted it. No wonder (perhaps you say) that they went to bed early. during the Christmas Holidays of 1888-89. CHARLES MEYMOTT TIDY, M.B., M.S., F.C.S. 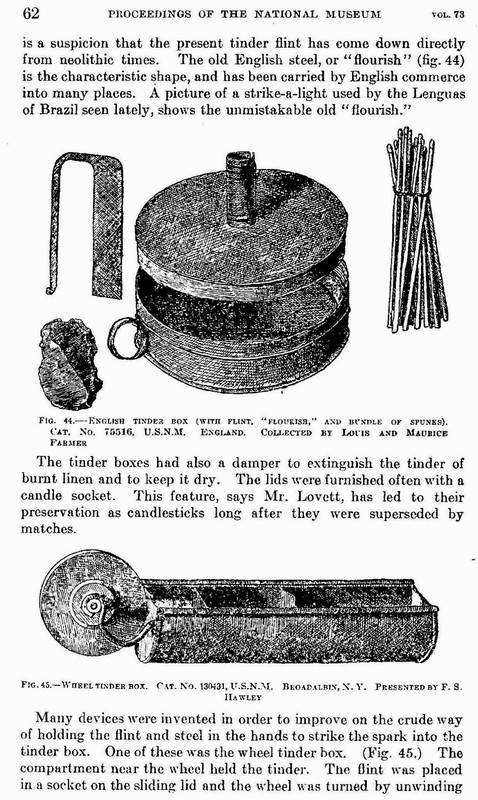 The fact that the tinderbox existed and was used is beyond doubt, what is being questioned here is "how was it used". My personal knowledge started a long time ago when I realised that I needed a renewable fire lighting method. As I was at that time already using flint and steel, this meant that I had to find a natural source of tinder growing in the wild, and I needed a way to prepare it. By experimentation I started to find several plants that could be used as tinder, but I needed to char most of them in a fire to make them catch a spark. This meant that I had to find a way to smother this smouldering tinder for future use. I started by burying it under earth, this worked okay, but soiled the tinder, and, this method could not be used in wet weather. Next I wrapped the smouldering tinder in soft leather and then buried it in the earth. This worked fine, but I needed to find an easier method. It was then one of those moments when you strike your forehead as the obvious comes to mind and you can't believe that you had not seen it before. The smouldering tinder was to be smothered in a tinderbox. From there it was but a short step to realising that in fact the fire was also created with the tinderbox. Subsequent experimentation and further research proved my findings to be correct. That of course was many years ago, and I made my first flint, steel and tinderbox video in 2008. A Short Living History Promotional Video. City Of Vice. A great series, each one very short. Flintlock Safety and Tips For Long Term Wilderness use of the Flintlock. Alone Yet Not Alone. Trailer.